Schedule our instructor led classroom training at your convenience and never miss another lecture or fall behind. You are in complete control. We invited the Best Cisco® Trainer in the industry to help us develop the ultimate training & certification program which includes everything you will need to fully prepare for your certification exams. The Cisco® IT training bundle includes ALL of our available Cisco OnDemand Learning and is the ultimate Cisco IT certification training bundle for any skill level. Cisco certification candidates will begin with the CCNA Certification courses such as CCENT, CCNA, CCNA Voice and CCNA Wireless. 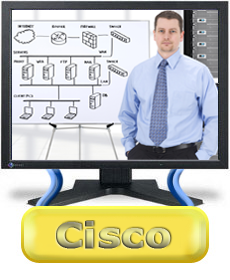 Cisco Certified Design Associate (CCDA) course is included as well. Our CCNP level courses includes CCNP Route, Switch and TSHOOT. Ken Mayer is a Certified Cisco Systems Instructor (CCSI), Microsoft Certified Trainer (MCT) as well as a Certified Ethical Hacker Trainer (CEH). He is also a Security consultant offering a wide variety of IT training and high level consulting projects for Fortune 500 companies across the United States and Western Europe. Ken has over 25 years combined experience in IT training and consulting. While achieving the Certified Cisco Systems Instructor certification Ken was involved in a two-day lab and observation event held on Cisco in Paris, France. This gave Ken the accreditation to be able to deliver Cisco Courses as a CCSI. Ken has taught numerous Cisco CCNA, CCDA, CCNP, CCDP and CCIP course curriculums, including Cisco's security appliances such as PIX and IDS. ICND1 course is associated with the CCENT certification which is a tangible first step in achieving the CCNA certification. The course includes topics on networking fundamentals; connecting to a WAN; basic security and wireless concepts; routing and switching fundamentals. ICND2 course is associated with the CCNA certification. The course covers topics on extending switched networks with VLANs; VLSM and IPv6 addressing; the VTP, RSTP, OSPF and EIGRP protocols. CCNA Voice certification validates associate-level knowledge and skills required to administer a voice network. This exam tests a candidate's knowledge of the architecture, components, functionalities, and features of Cisco Unified Communications solutions. CCNA Wireless certification validates associate-level knowledge and skills to configure, implement and support of wireless LANs, specifically those networks using Cisco equipment. The SWITCH course is one of three components in the CCNP curriculum. SWITCH is designed for network engineers with at least one year of professional work experience, who are ready to advance their skills and work independently on complex network solutions. The TSHOOT exam will certify that the successful candidate has important knowledge and skills necessary to (1) plan and perform regular maintenance on complex enterprise routed and switched networks and (2) use technology-based practices and a systematic ITIL-compliant approach to perform network troubleshooting. The ROUTE exam will certify that the successful candidate has the knowledge and skills necessary to use advanced IP addressing and routing in implementing scalable and secure Cisco ISR routers connected to LANs and WANs. With a CCDA certification, a network professional demonstrates the skills required to design routed and switched network infrastructures and services involving LAN, WAN, and broadband access for businesses and organizations.